The 3DS eShop finally comes to the 3DS on June 6 in the United States and June 7 in Japan. The service is similar to the Wii Channel and DSiWare platform of digital delivery but it also marks a new direction Nintendo is taking with their online service. The overall impression I got with the new eShop is that Nintendo will be a lot more involved with the promotion of content, before, during and after a game's release. There's a lot you can expect with the eShop's launch next including an easy way to transfer DSiWare games, new features for original Game Boy games and a new day of the week for digital releases from Nintendo. First thing's first, the Virtual Console will have three original Game Boy games at launch consisting of Super Mario Land, Alleyway and Radar Mission. The store will only carry original Game Boy and Game Boy Color games at first with more platforms possibly on the way in the future. There's more to the Virtual Console which you can read about here. 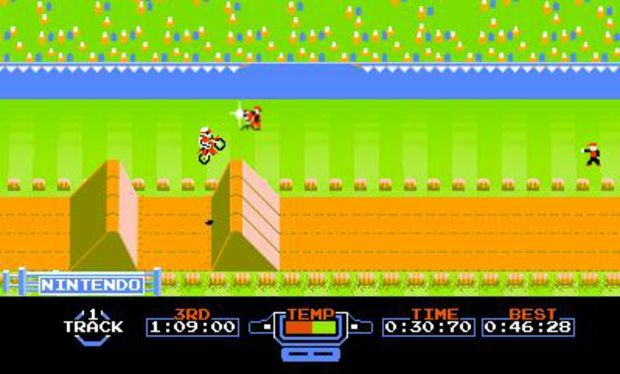 Another service of the eShop on the 3DS will see 3D remasterings of classic titles, like Excitebike! In fact, Excitebike will be available for free for a month and will be released the day the eShop launches next week. After the first 30 days, Excitebike 3D will go for $5.99. I went hands-on with Excitebike 3D and the 3D effect is pretty neat. The 3D feature increases the depth of the track you're racing on and makes it seem like the tracks are much bigger. Otherwise, it's the exact same Excitebike like you remember, but with 3D effects that work well thanks to the simplistic graphics. There's a track editor too and you can save up to 32 custom tracks. You sadly won't be able to share the custom course with others. On the DSiWare side of things, 350 titles will be available at launch on the eShop. Here's the good news for those of you who already own DSiWare games and felt stuck with your DSi handhelds: You'll be able to move over your digital games over with what seems like an easy process. DSi and DSi XL owners will simply download a transfer tool on their handheld and initiate the transfer process. Then on the 3DS, users will accept the transfer and that's it. The transferred games will automatically be deleted from their original source. As for the general interface, imagine the 3DS eShop menu like the Wii Channel layout but with just made up of one row. Navigating the menu to the right on the bottom screen takes you to all the games on offer, like the Virtual Console and DSiWare stores detailed above. The categories following that are more specialized sections that Nintendo will change up on a regular basis. Some of the initial categories you'll see at launch will be "Staff pick of the week," "Two player games," "Mario games," and "Games that start with W." It's essentially like browsing categories on Netflix. Of course you can search for specific titles by typing it in and there's a search bar at the top level of the navigation for easy access at all times. Speaking of Netflix, the service will just be like it is on the Wii. The application will appear in your main menu and you'll be able to watch movies right on your handheld. While we won't be seeing 3D movies from Netflix (this could change in the future), Nintendo will have a 3D video service. You can expect plenty of media for all the games as Nintendo is making it easier for consumers to be informed about what they're looking to purchase. Pulling up a game, in this case Plants Vs Zombies for DSiWare, displays some general info about the product on the top screen, including artwork displayed in 2D or 3D depending on the title. You'll even be able to visit a products website (like Popcap) through the embedded web browser from the specific game's info. Nintendo will also display screenshots and videos for the games. In fact, Nintendo went back and created over 400 trailers for all the DSiWare titles for the eShop. Upcoming releases (both digital and physical) will be given attention like trailers and screenshots (standard and 3D depending on the game) on the eShop as well. This is great considering we typically don't know what's coming out until Nintendo has released the games. On that note, Nintendo is planning on moving digital releases to Thursdays now instead of Monday and this goes into effect on June 16. All throughout your navigating adventures, you'll be able to bookmark games to a personal wishlist. This is good as a personal reminder or for kids who want to get their parents to buy them something. Purchasing games will be a lot more transparent now too as the amount you have in your eShop wallet is displayed in real currency as opposed to Wii Points. You'll unfortunately still have to bear with entering your credit card info each time you need to fill up your wallet or buy something. Nintendo told me that they are looking to make this whole process a lot more user friendly soon, at least. 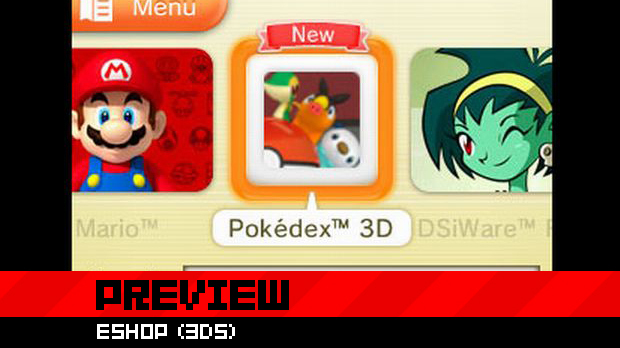 One final feature to note is that you'll be able to rate every game for the 3DS, both physical and downloadable games. 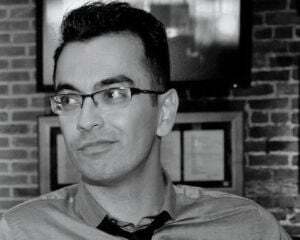 You'll be able to anonymously assign star ratings and pre-selected messages such as "This is good." The best part of this though is that you can't rate any game at all until you've played it for at least an hour. A rating option won't even appear until you've meet the requirements. Navigating the main menu to the left will take you to stuff like news, recent arrivals (containing the last 20 games to hit the service), Charts (displays the most popular/most downloaded titles), a more advanced search feature, your wishlist, rate games and adding funds. All these categories can be quickly accessed through a dropdown menu for easier access when in other parts of the eShop. All in all, the service sounds like it's going to be a lot more user friendly and Nintendo is giving a bigger spotlight on all the titles that come through the eShop. I'm looking forward to seeing what other Game Boy games make it to the Virtual Console. The Game Boy was my first gaming anything so I'm hoping to see titles like the original Tetris and even the Game Boy Camera make a come back at some point. P.S. You can now add your 3DS friend codes onto your Dtoid profiles!